Coaching in Moretown, Vermont, is sitting in a shady spot behind her horse barn. She stares out over grazed pastures lolling gently down to where the Mad River meets the Winooski River. There is a general sense of calm. She is speaking of the indigenous populations that once used these waterways. And, in a way, this place pays homage to that history in that it remains a space where one can step away from the constant stress of life to share, reflect, communicate, and reassess. Individuals as well as business groups visit Pathfinders because they want to discover a new way of being. To do that, they work with horses. The kind of exercises used depends on the group or individual. Some involve a variety of communication methods within the groups and with the horses to accomplish a task or make it through an obstacle course. “When you do something like that, its forcing everyone to really slow down,” Newman explains. “It gets interesting. Sometimes there can be a bit of a breakdown. That’s what I’m there for, to coach them through it.” This is when Newman starts to see different styles of leadership. Every animal has a different kind of intelligence. For horses, which have had a unique relationship with humans since 5000 BCE, almost 2,000 years older than written script, Newman believes they evolved an ability to sense what she calls predatorial energy. Horses handle this sort of static in different ways. Sometimes they will walk away, sometimes they’ll stay and listen, and sometimes they’ll try to turn the situation around. How they react can then help people who are struggling to “un-stuck” themselves and find the breakthrough they’re looking for. When participants are trying to develop leadership skills, they can think about how horses do it. Newman believes that when it comes to the horses, it all boils down to two questions: who is leading and where are you going? To be a successful herd, they have to know these answers. To be a successful business team, the same questions apply. It’s important to know who you are, whether you’re a leader or a follower, and to have a sense of your direction. This ultimately leads to bigger questions, the questions that connect the social structure of horses to that of humans: Are we together? Are we with each other? Am I okay? 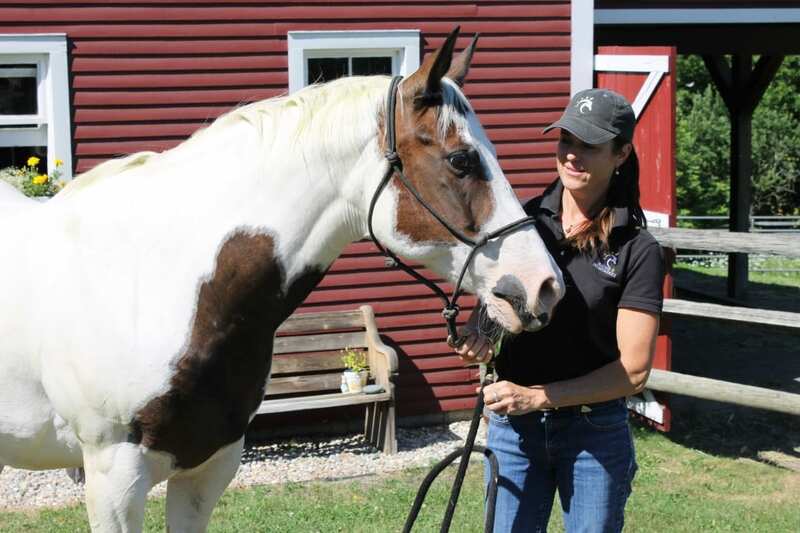 Lucinda Newman landed in Moretown in 2001 and her relationships with the horses blossomed organically. At the time, Newman was a management consultant for nonprofits and NGOs. But what she loved most was organizational development. No matter what she was hired for, she always thought that the key components at work went deeper than originally thought. It all came back to people and how their strengths were or were not being utilized. 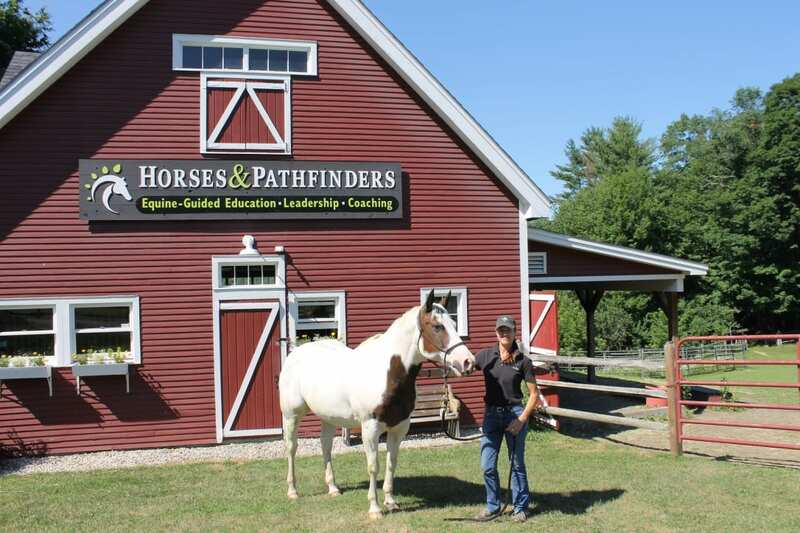 Horses and Pathfinders offers a few different courses, from individual work and somatic horsemanship to business coaching. All go back to her main focus of leadership development. Which is why working with horses, with a social and hierarchal structure similar to ours, is so effective. But to be successful, a lead mare and her herd must have certain key ingredients. Each member has a specific job. When each member is really using their individual strengths, the herd is strengthened. Newman believes that you can apply this same group dynamic to humans in what she calls Change Leadership. Examining leadership with horses allows for people to get a little bit outside themselves. Suddenly they can see what is working for them and what isn’t working for them. They can examine how their strengths are and are not being utilized. If the horse isn’t going with you, however, it’s a wall. You cannot make a horse go. Participants then have to try different things and Newman is there to give tips and guidance. And then, after discovery, comes change. “In the early days, I was lit up about it. I learned not to talk about it to people who would roll their eyes. Or say, ‘Oh good luck with that.’ And I thought, I’m going to keep going. And I did. It was hard. As a single mom and a woman… even in the downturn in 2008… But I made it through.” By 2013, Pathfinders had really begun to take off. Do I know where I am going? And am I connected?